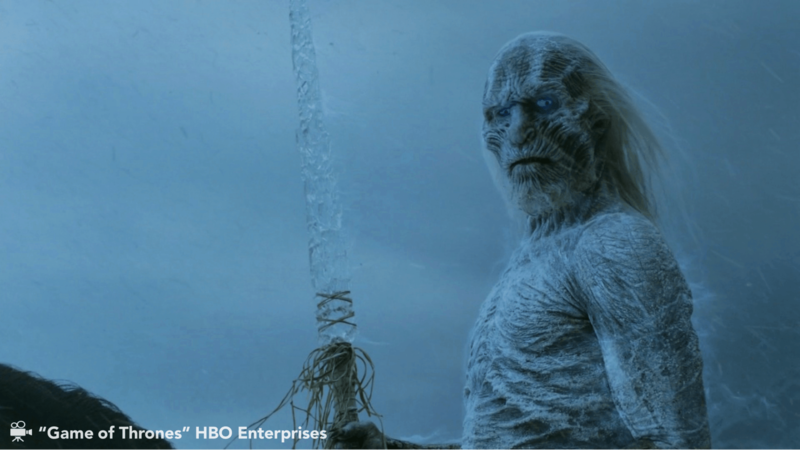 Authors Note: Special thanks to Johnny Walker, Katie White, Aja DelGaudio, John Nolan, Sean Duhaime, Chris Pao, Laurel Hurd, and Meghan Lockwood for the many content contributions (not to mention hours) you gifted to this blog. At Acorio, we are obviously giant fans of ServiceNow — our entire business is 100% exclusively focused on guiding clients through their personal ServiceNow transformation. 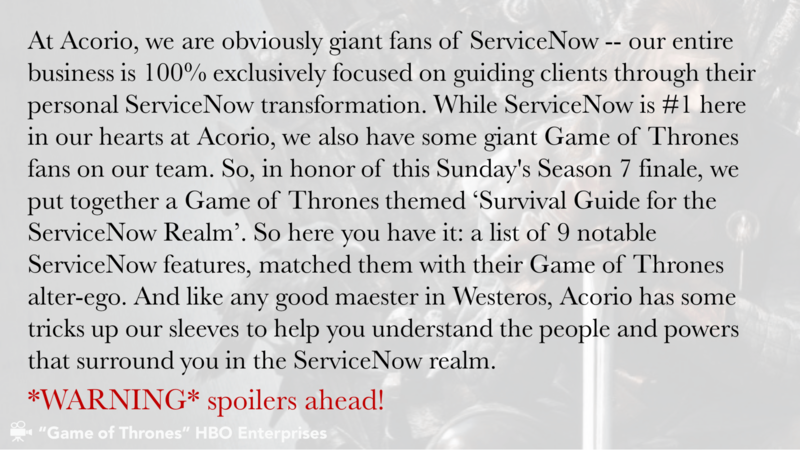 While ServiceNow is #1 here in our hearts at Acorio, we also have some giant Game of Thrones fans on our team. 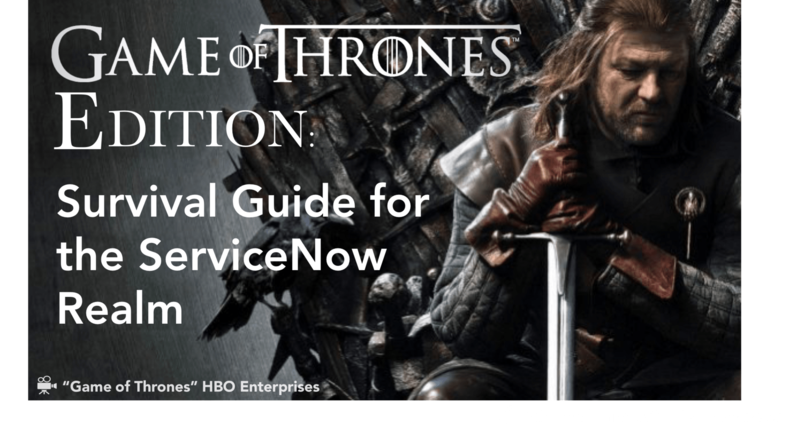 So, in honor of this Sunday’s Season 7 finale, we put together a Game of Thrones themed ‘Survival Guide for the ServiceNow Realm’. 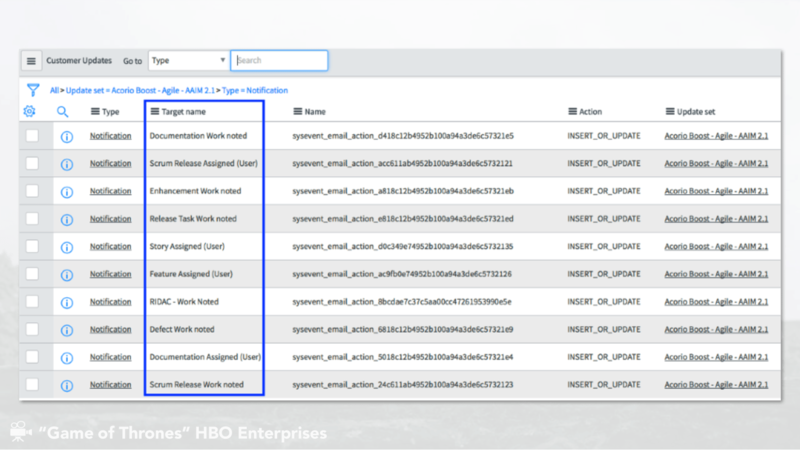 So here you have it: a list of 9 notable ServiceNow features, matched with their Game of Thrones alter-ego. 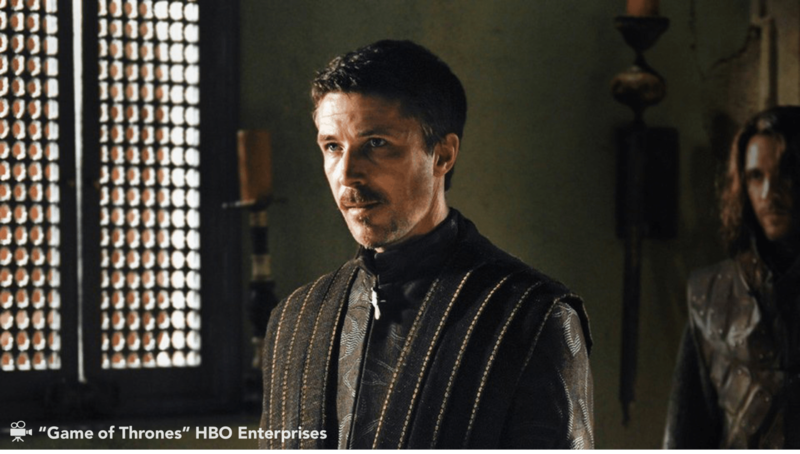 And like any good maester in Westeros, Acorio has some tricks up our sleeves to help you understand the people and powers that surround you in the ServiceNow realm. 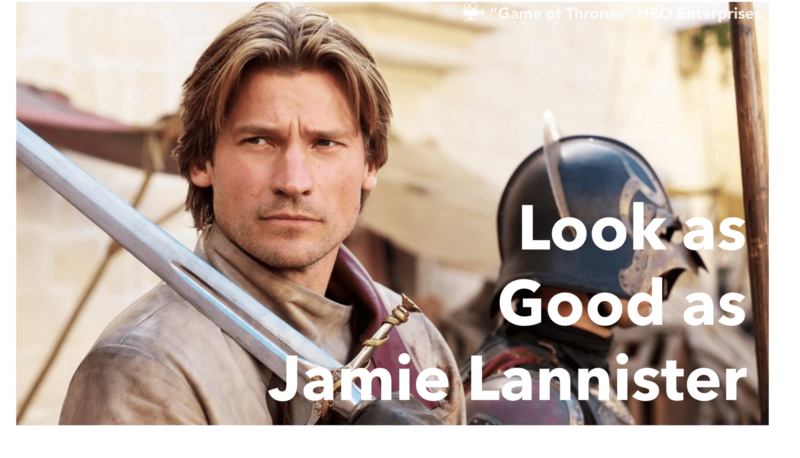 Feel free to click through this SlideShare to read our 9 notable ServiceNow features and their GoT alter-ego. If slides aren’t your thing, don’t worry about it – just keep scrolling down! Out of box, ServiceNow’s Service Portal widgets offer a simple, straightforward template for your company’s service portal. 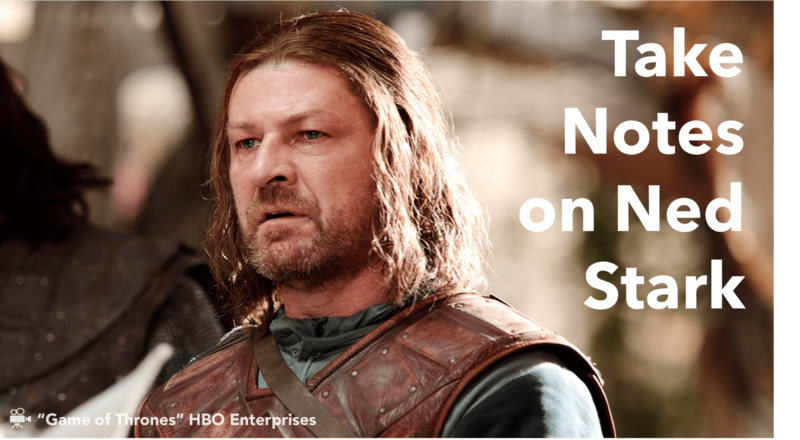 And just like Ned Stark, they are consistent and unambiguous. 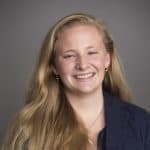 While we appreciate the structure that these OOB widgets provide, their consistency can also cause problems for clients looking to diversify the formats of different pages within their Service Portal. 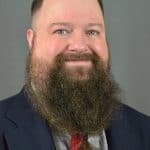 It is a double-edged sword: these widgets act as a great accelerator for building a functional Service Portal template, but clients must pledge allegiance to the code (and its fewer options for customizing Service Portal OOB). 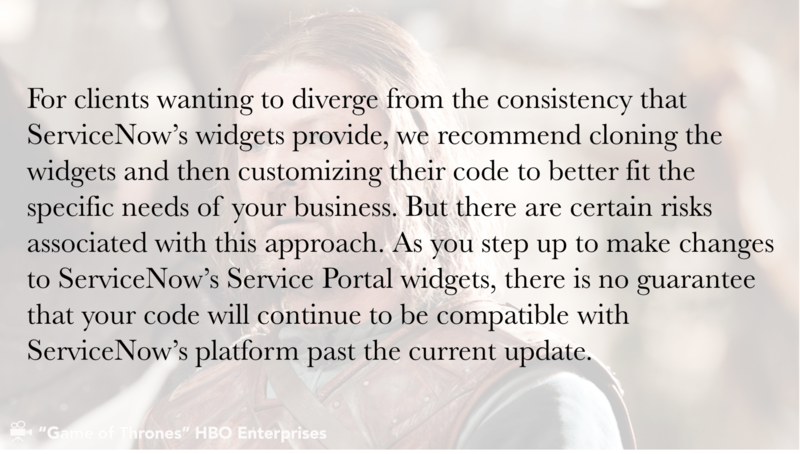 For clients wanting to diverge from the consistency that ServiceNow’s widgets provide, we recommend cloning the widgets and then customizing their code to better fit the specific needs of your business. But there are certain risks associated with this approach. 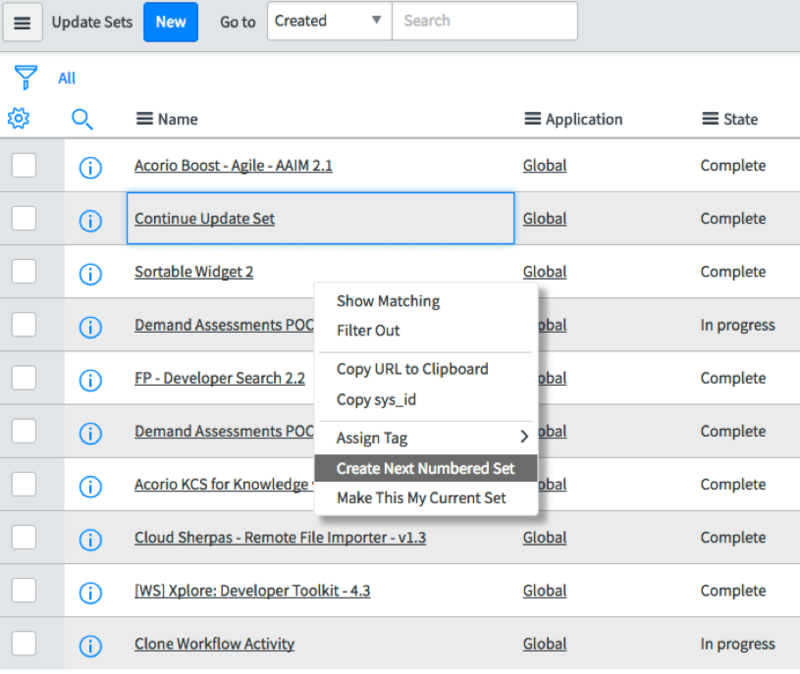 As you step up to make changes to ServiceNow’s Service Portal widgets, there is no guarantee that your code will continue to be compatible with ServiceNow’s platform past the current update. We all know how Ned Stark’s story ends, and because of this you may be hesitant to stray too far from ServiceNow OOB Service Portal Widgets, but keep in mind that Lord Stark did not have the Acorio maesters at his side. If you are looking to step off the beaten path and try something new, we have plenty of pre-coded widgets to help you make the most of your Service Portal and ensure that it is the perfect fit for what your company needs. 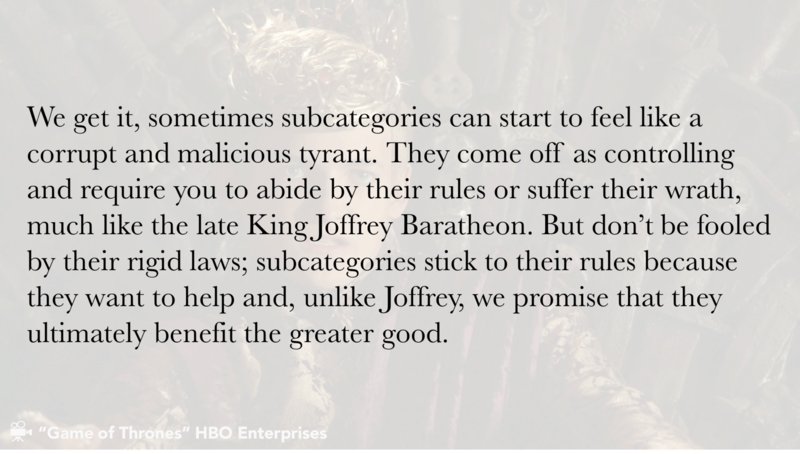 We get it, sometimes subcategories can start to feel like a corrupt and malicious tyrant. 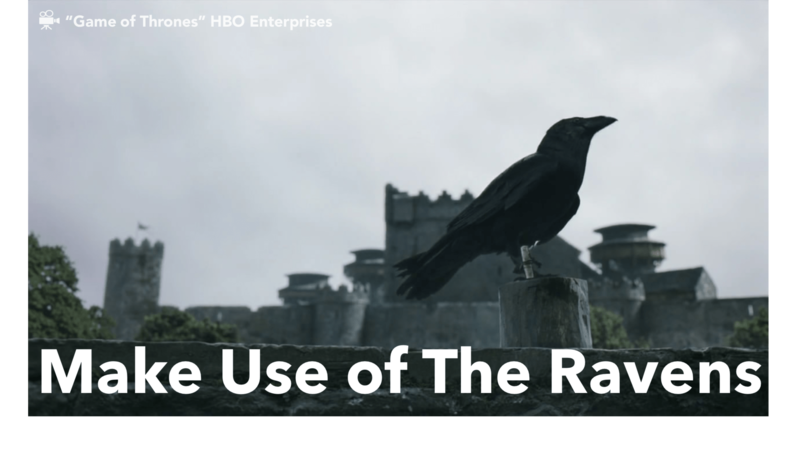 They come off as controlling and require you to abide by their rules or suffer their wrath, much like the late King Joffrey Baratheon. 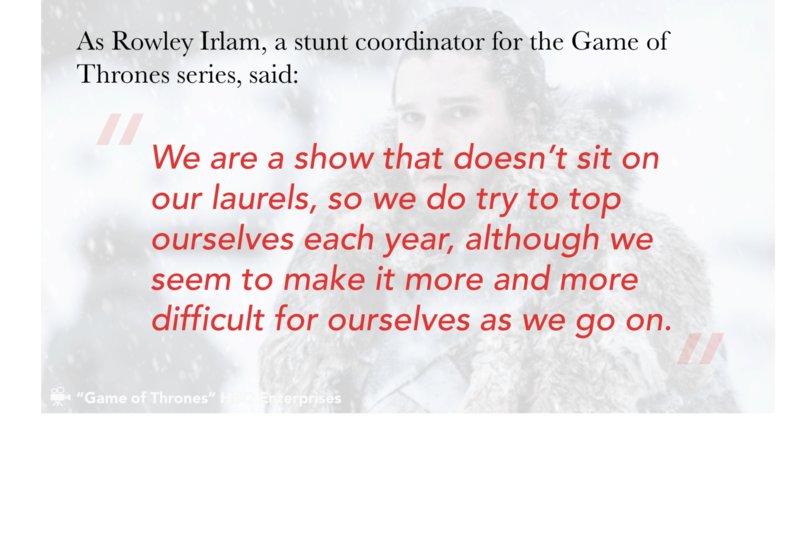 But don’t be fooled by their rigid laws; subcategories stick to their rules because they want to help and, unlike Joffrey, we promise that they ultimately benefit the greater good. To keep it straightforward for your fulfillers and help them avoid confusion, do your best to limit the number of subcategories they have to choose from, and the number of options included in each of those levels. 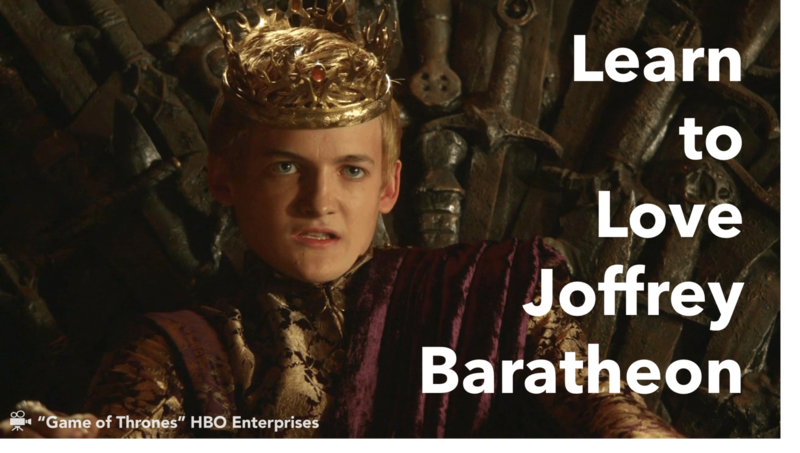 This approach will turn King Joffrey into a ruler you can actually get along with. 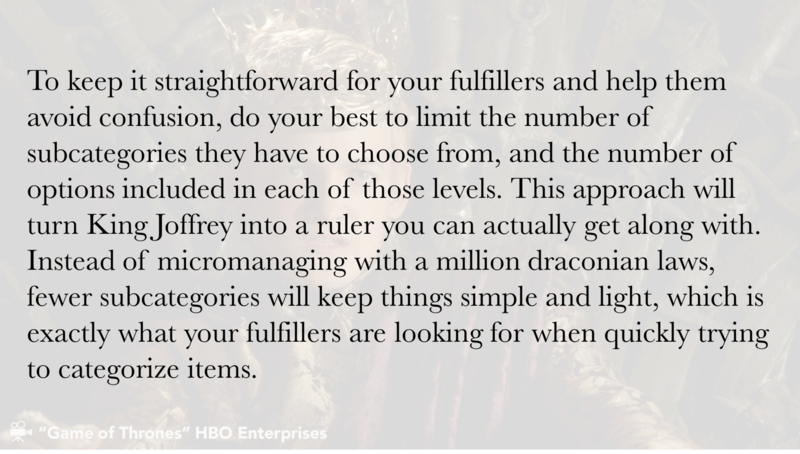 Instead of micromanaging with a million draconian laws, fewer subcategories will keep things simple and light, which is exactly what your fulfillers are looking for when quickly trying to categorize items. Big changes can oftentimes have unintended consequences. 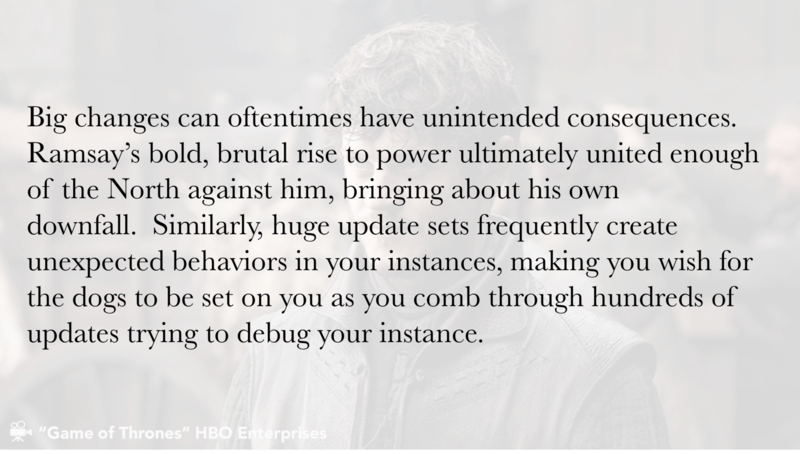 Ramsay’s bold, brutal rise to power ultimately united enough of the North against him, bringing about his own downfall. Similarly, huge update sets frequently create unexpected behaviors in your instances, making you wish for the dogs to be set on you as you comb through hundreds of updates trying to debug your instance. 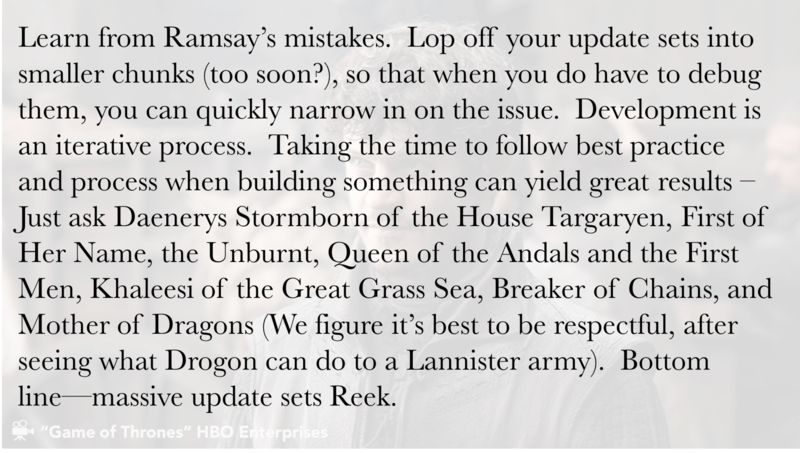 Learn from Ramsay’s mistakes. Lop off your update sets into smaller chunks (too soon? ), so that when you do have to debug them, you can quickly narrow in on the issue. Development is an iterative process. 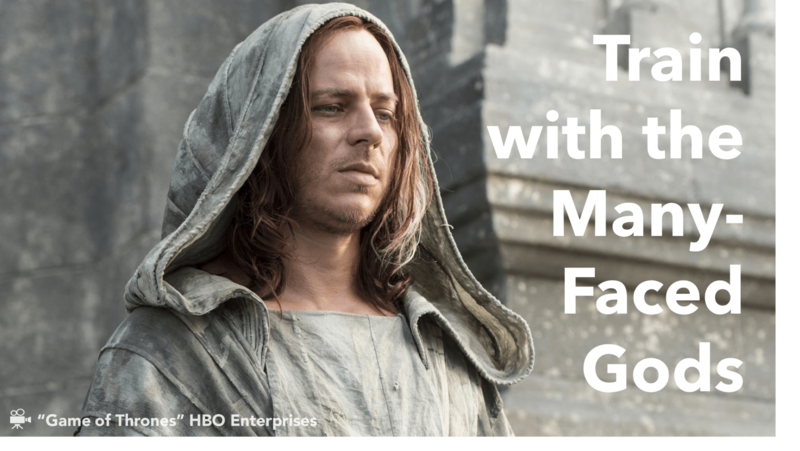 Taking the time to follow best practice and process when building something can yield great results – Just ask Daenerys Stormborn of the House Targaryen, First of Her Name, the Unburnt, Queen of the Andals and the First Men, Khaleesi of the Great Grass Sea, Breaker of Chains, and Mother of Dragons (We figure it’s best to be respectful, after seeing what Drogon can do to a Lannister army). Bottom line—massive update sets Reek. 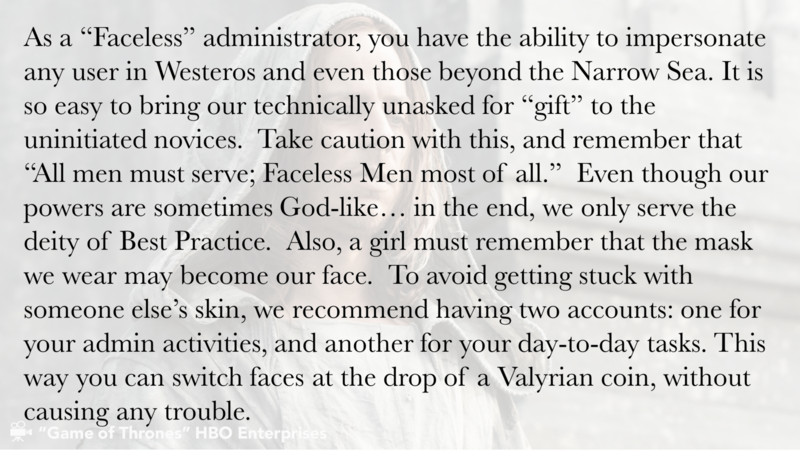 As a “Faceless” administrator, you have the ability to impersonate any user in Westeros and even those beyond the Narrow Sea. It is so easy to bring our technically unasked for “gift” to the uninitiated novices. 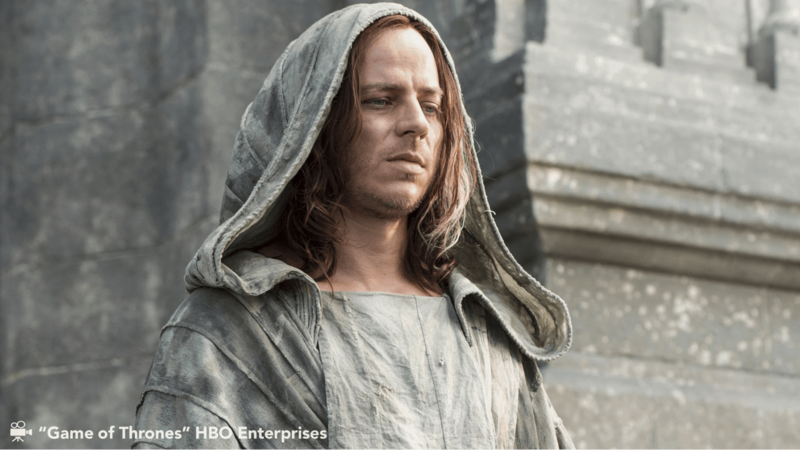 Take caution with this, and remember that “All men must serve; Faceless Men most of all.” Even though our powers are sometimes God-like… in the end, we only serve the deity of Best Practice. Also, a girl must remember that the mask we wear may become our face. To avoid getting stuck with someone else’s skin, we recommend having two accounts: one for your admin activities, and another for your day-to-day tasks. This way you can switch faces at the drop of a Valyrian coin, without causing any trouble. Notifications are an essential part of working within the diverse ServiceNow ecosystem. 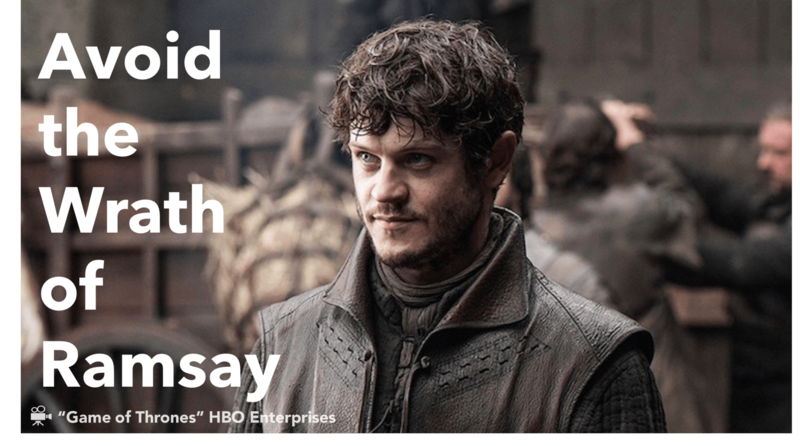 While working on your Epics and Stories, it is vital to send word of any recent plot changes to your valiant development team as they struggle to tame the Free Folk or slay their coding dragons. 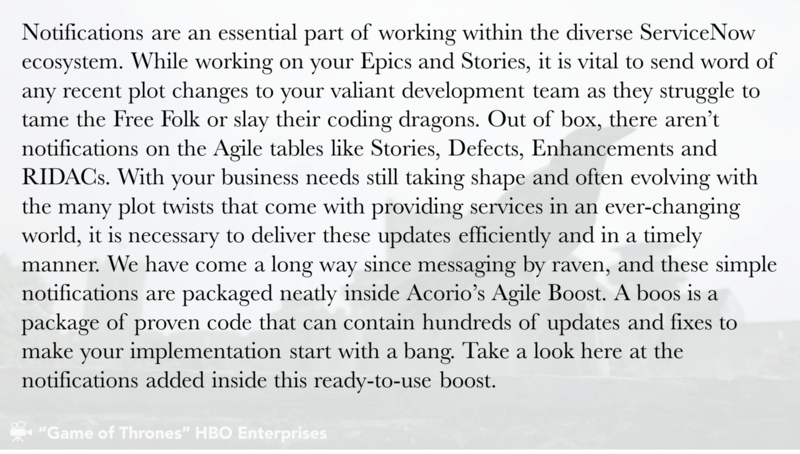 Out of the box, there aren’t notifications on the Agile tables like Stories, Defects, Enhancements, and RIDACs. With your business needs still taking shape and often evolving with the many plot twists that come with providing services in an ever-changing world, it is necessary to deliver these updates efficiently and in a timely manner. We have come a long way since messaging by raven, and these simple notifications are packaged neatly inside Acorio’s Agile Boost. A boost is a package of proven code that can contain hundreds of updates and fixes to make your implementation start with a bang. Take a look here at the notifications added inside this ready-to-use boost. 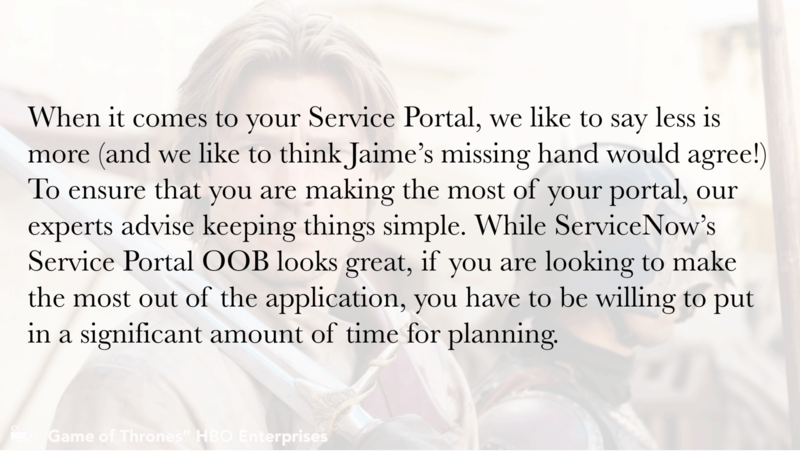 When it comes to your Service Portal, we like to say less is more (and we like to think Jaime’s missing hand would agree!) To ensure that you are making the most of your portal, our experts advise keeping things simple. 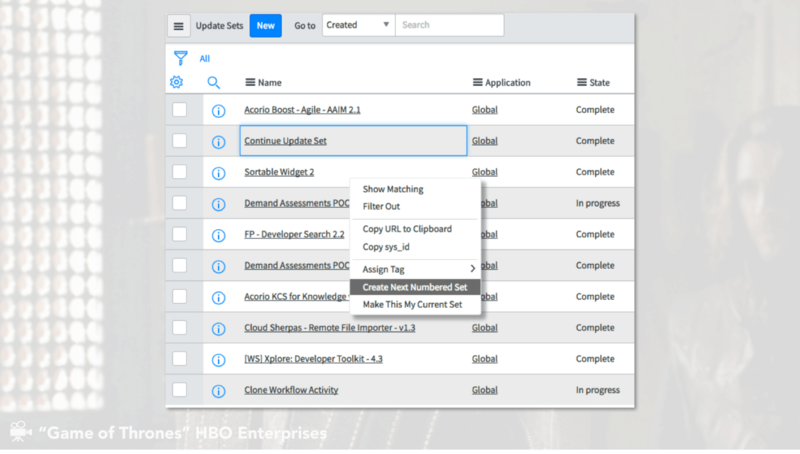 While ServiceNow’s Service Portal OOB looks great, if you are looking to make the most out of the application, you have to be willing to put in a significant amount of time for planning. You should strive to be as straightforward and organized as possible, that way your clients are not overwhelmed with too much information muddled onto one page. When it comes to your Service Portal, minimizing clutter is a must. It is important to put yourself in your customers’ shoes; think about why they are using your portal, and anticipate what questions they might have, then make sure this information is clear and easy to find. Think of it like this: you don’t have to be trained on how to use Amazon, it just makes sense. The same thing should be true for your portal and its users. 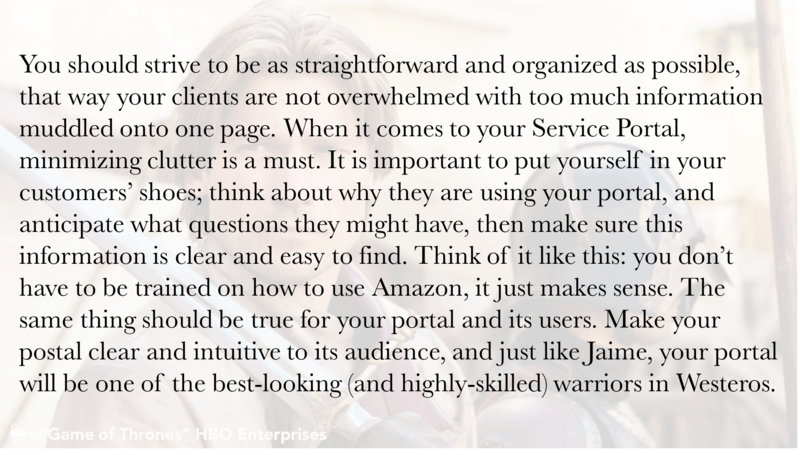 Make your postal clear and intuitive to its audience, and just like Jaime, your portal will be one of the best-looking (and highly-skilled) warriors in Westeros. 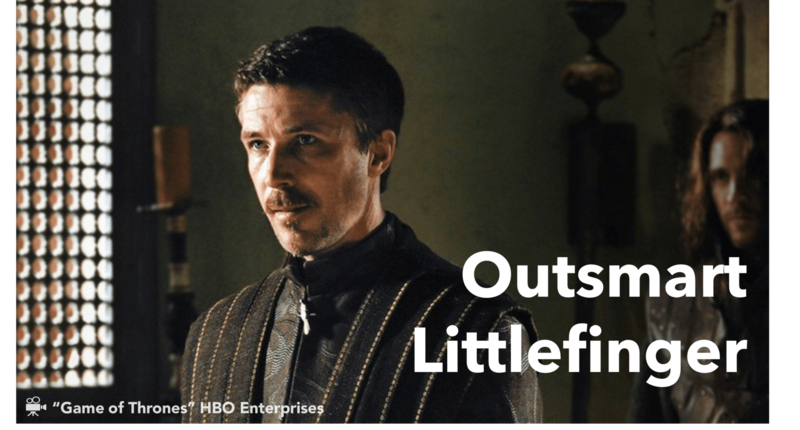 We know that Littlefinger likes to stick his nose into everything, pretending to be helpful, while usually not having your best interest at heart. 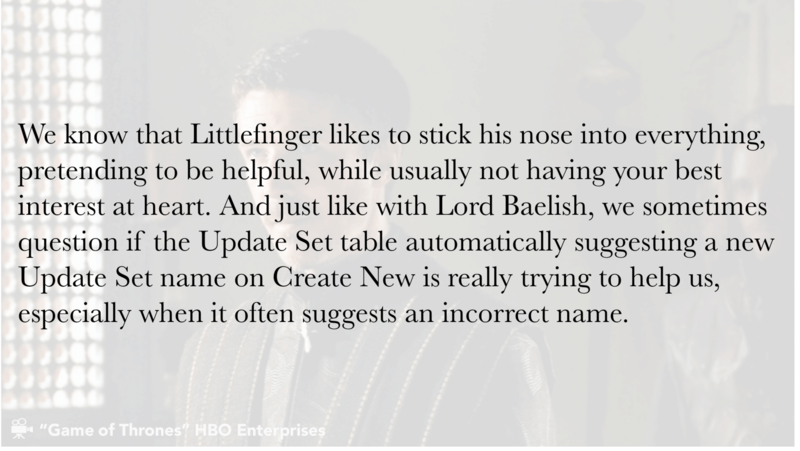 And just like with Lord Baelish, we sometimes question if the Update Set table automatically suggesting a new Update Set name on Create New is really trying to help us, especially when it often suggests an incorrect name. During the “chaos” of performing a clone over your Dev environment while development is still actively taking place, and to assist you to “climb that ladder” (and avoid the stresses of Petyr Baelish), we recommend adding a simple UI Action to create a new Update Set from a previously closed set. This UI Action will read the name of a completed Update Set of your choice and then add or increment an integer to the end. ie: “My Set Name 2.” This should allow your Developers and Admins to continue their work unabated while you maintain the regular cycle of cloning from your Production environment to your Development environment. The 3-eyed raven is a powerful force within the Game of Thrones realm. 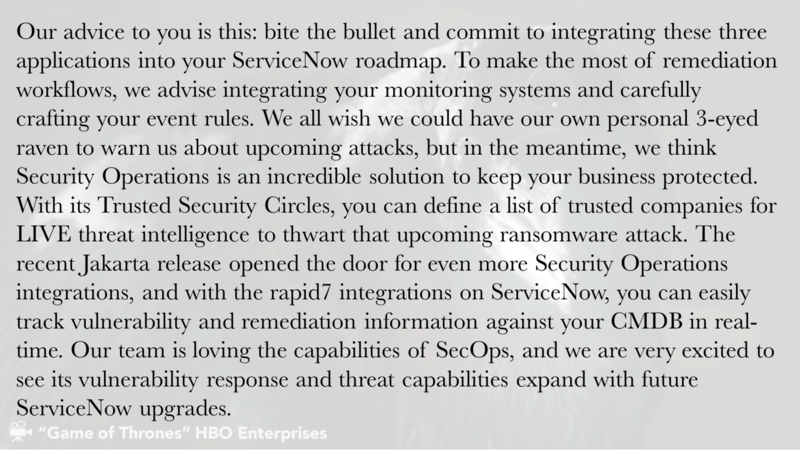 And for his ServiceNow alter-ego, we knew we had to pick an all-star application. With their combined capability to not only get a definitive view of your security posture, but also automate IT processes for operations management and create actionable alerts that enable IT to eliminate service outages, we think Event Management, Security Operations, and Orchestration are a strong triple-threat, rivaled only by the 3-eyed raven and his ability to see into the past, present, and future. Our advice to you is this: bite the bullet and commit to integrating these three applications into your ServiceNow roadmap. 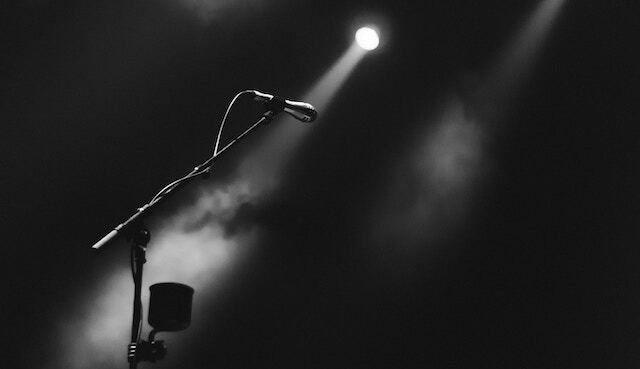 To make the most of remediation workflows, we advise integrating your monitoring systems and carefully crafting your event rules. 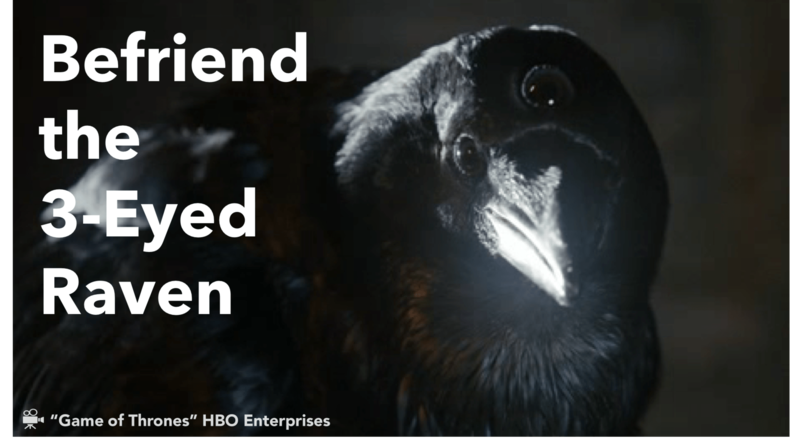 We all wish we could have our own personal 3-eyed raven to warn us about upcoming attacks, but in the meantime, we think Security Operations is an incredible solution to keep your business protected. 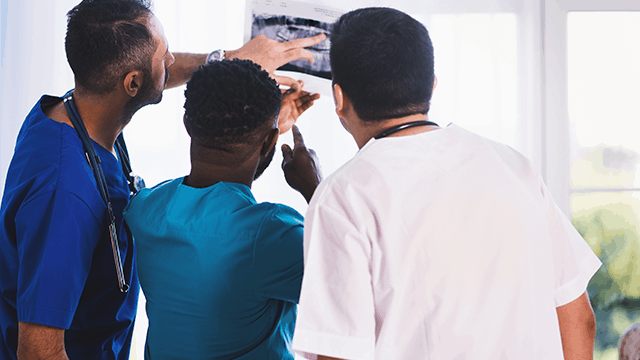 With its Trusted Security Circles, you can define a list of trusted companies for LIVE threat intelligence to thwart that upcoming ransomware attack. 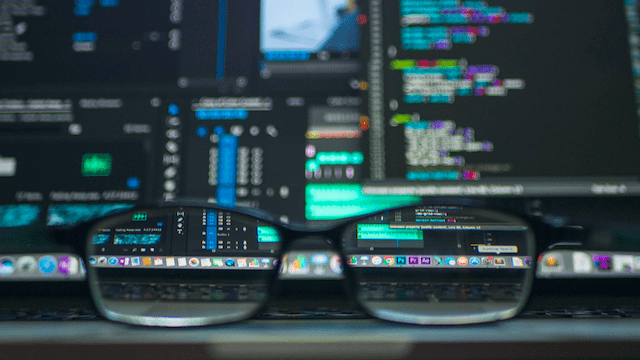 The recent Jakarta release opened the door for even more Security Operations integrations, and with the rapid7 integrations on ServiceNow, you can easily track vulnerability and remediation information against your CMDB in real-time. 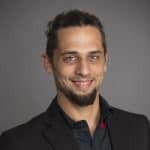 Our team is loving the capabilities of SecOps, and we are very excited to see its vulnerability response and threat capabilities expand with future ServiceNow upgrades. 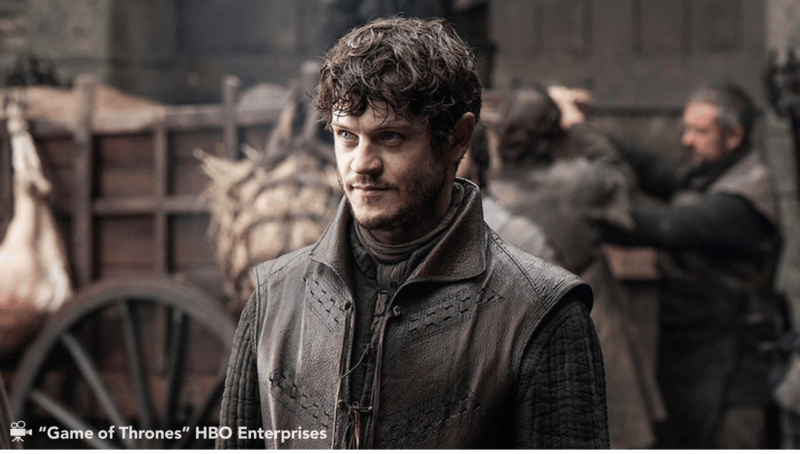 Just like Bran was overwhelmed when first introduced to his new abilities, we understand that these three applications can come across as a tough beast to tame. We are here to assure you that all of this time and effort is most definitely worth the investment. With this dynamic trio of applications at your side, you can eliminate risks and incidents by automatically kicking off scripts and testing the security of your applications and network infrastructure, leaving your admins with organized reports and a clear dashboard right at their fingertips. This foresight, coupled with the ability to prevent attacks before they even happen, is something we wish Bran could tap into to help fight the Army of the Dead, but we guess he has not gotten around to exploring the ServiceNow platform (yet). 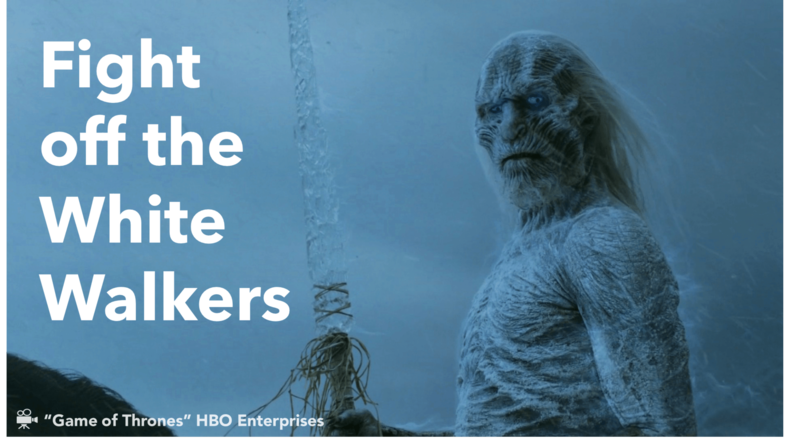 The White Walkers are the biggest villains our characters have to face in Game of Thrones, so there was no question as to who their ServiceNow alter-ego would be: the competition of our clients. 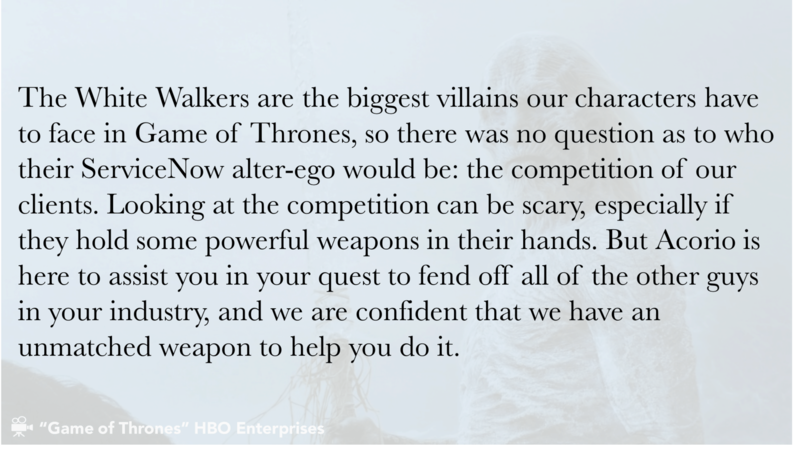 Looking at the competition can be scary, especially if they hold some powerful weapons in their hands. But Acorio is here to assist you in your quest to fend off all of the other guys in your industry, and we are confident that we have an unmatched weapon to help you do it. 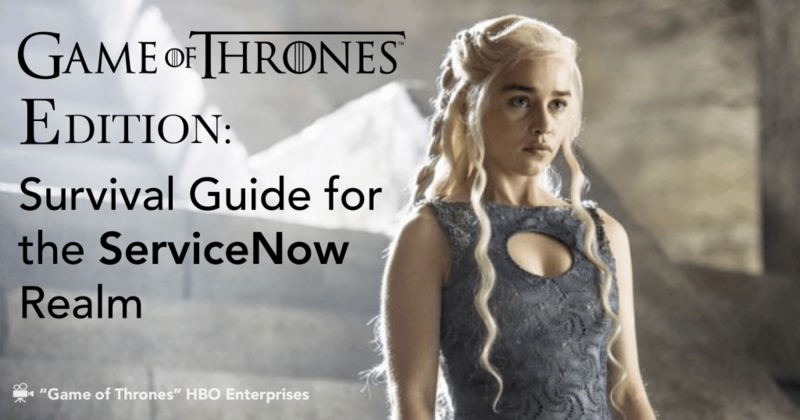 Think of ServiceNow as your personal, infinite supply of dragon glass. You use it to craft creative, state-of-the-art tools to fight off the competitors that make your life hard. 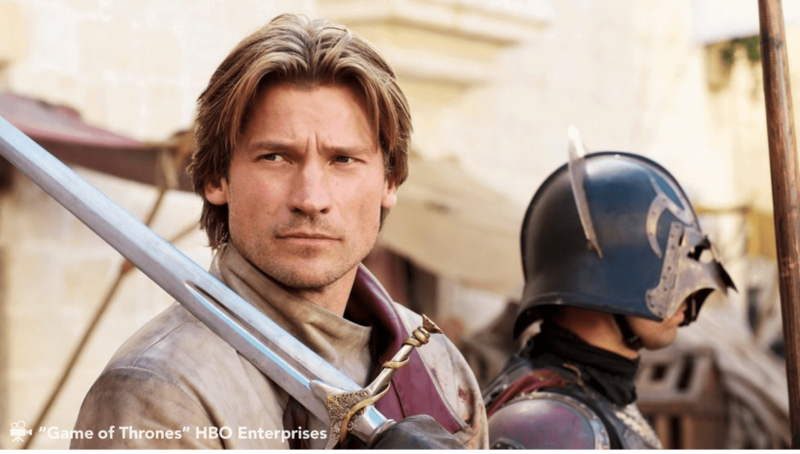 Sure, upon introduction those monsters might seem like a tough power to battle, but with ServiceNow and Acorio on your side, the odds are in your favor. With us on your team, you are destined to bring an end to the long, cold winter. 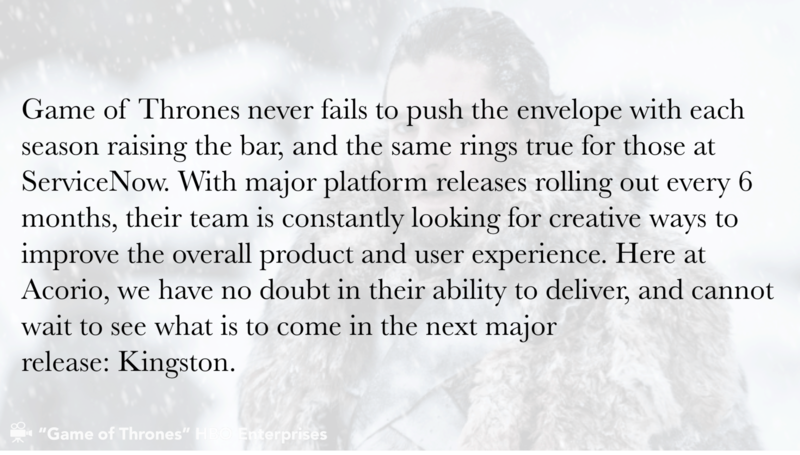 Game of Thrones never fails to push the envelope with each season raising the bar, and the same rings true for those at ServiceNow. 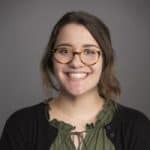 With major platform releases rolling out every 6 months, their team is constantly looking for creative ways to improve the overall product and user experience. Here at Acorio, we have no doubt in their ability to deliver, and cannot wait to see what is to come in the next major release: Kingston. We love ServiceNow and the wonderful services it provides to clients. At the end of the day, there is no one else that we would rather see on the Iron Throne. No other product, we think, could rule over all seven kingdoms, nor inspire so many to give themselves to the cause. Our allegiance to the ServiceNow platform is strong, and we will not be bending the knee for anyone else anytime soon (except maybe Jon Snow).